Charles-Maurice de Talleyrand-Périgord (/ˈtælərænd ˈpɛrɪɡɔːr/; French: [ʃaʁl moʁis də tal(ɛ)ʁɑ̃ peʁiɡɔʁ]; 2 February 1754 – 17 May 1838), 1st Prince of Benevento, then 1st Duke of Talleyrand, was a French politician and diplomat. After theology studies, he became in 1780 Agent-General of the Clergy and represented the Catholic Church to the French Crown. He worked at the highest levels of successive French governments, most commonly as foreign minister or in some other diplomatic capacity. 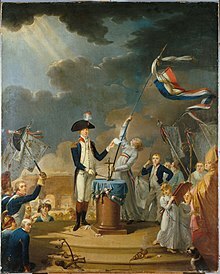 His career spanned the regimes of Louis XVI, the years of the French Revolution, Napoleon, Louis XVIII, and Louis-Philippe. Those he served often distrusted Talleyrand but, like Napoleon, found him extremely useful. The name "Talleyrand" has become a byword for crafty, cynical diplomacy. Talleyrand had a reputation as a voluptuary and a womaniser. He left no legitimate children, though probably fathered illegitimate ones. Four possible children of his have been identified: Charles Joseph, comte de Flahaut, generally accepted to be an illegitimate son of Talleyrand; the painter Eugène Delacroix, once rumoured to be Talleyrand's son, though this is doubted by historians who have examined the issue (for example, Léon Noël, French ambassador); the "Mysterious Charlotte", possibly his daughter by his future wife, Catherine Worlée Grand; and Pauline, ostensibly the daughter of the Duke and Duchess Dino. Of these four, only the first is given credence by historians. 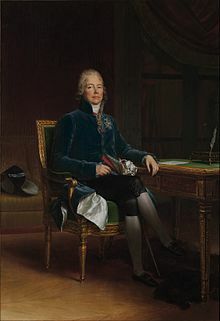 However, the French historian Emmanuel de Waresquiel has lately given much credibility to father-daughter link between Talleyrand and Pauline whom he referred to as "my dear Minette". ^ "Remembering Talleyrand". Restorus. 17 May 2016. Retrieved 25 July 2018. ^ Haine, Scott. The History of France (1st ed.). Greenwood Press. p. 93. ISBN 0-313-30328-2. Retrieved 6 September 2016. This page was last edited on 22 April 2019, at 15:44 (UTC).